Depth is typically 12% of the span, so the roadway has to be higher if the bridge is to have sufficient clearance over water, railways etc. Although expensive, stayed bridges may be the only viable alternative when: there is no access to the gap, on which temporary or permanent piers could be built; when there is no straight level run up to the gap which would permit cantilever launching; when the span is too big for regular through truss bridges. And, in particular, one-tower bridges are useful if there is no good access to the far bank, as they can be built from one side only. But please note: you still need enough space for the large counterweights, which may need to be one fifth of the span for a two tower bridge. 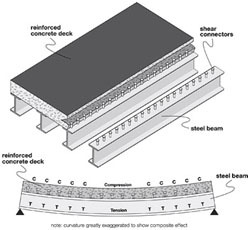 Word 'Composite' means that the steel structure of a bridge is fixed to the concrete structure of the deck so that the steel and concrete act together, so reducing deflections and increasing strength. This is done using 'shear connectors' fixed to the steel beams and then embedded in the concrete. Shear connectors can be welded on, perhaps using a 'stud welder', or better still on export work, by fixing nuts and bolts. Shear connectors, correctly spaced to resist the loads, make the concrete work 'compositely' with the steel. Usually the steel carries its own weight and that of the wet concrete. 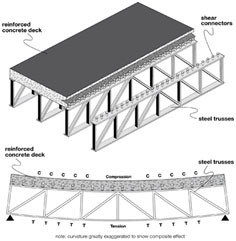 But when the concrete is 'cured' and has acquired its full strength, then all future loads (traffic, surfacing, wind, water, pressure, seismic loads) are shared by the steel/concrete composite. On short spans (8m, 10m, 15m and then more expensively up to 24m), bridges can be made from a number of beams under the roadway straight across the gap. The bridges benefit the most from composite action. Annotation: exaggerated deflected shape showing bending, with concrete carrying some of the compression (C) and steel carrying all the tension (T). 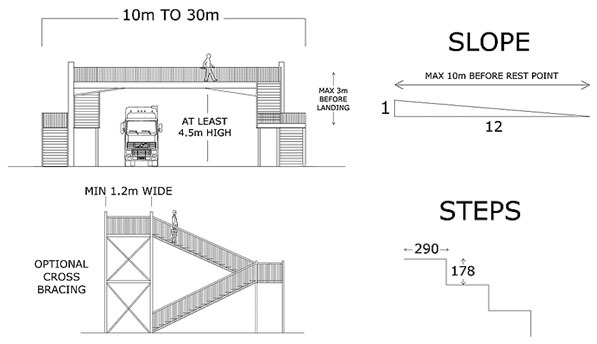 These are similar to simple beam bridges but for longer spans, from say 18m up to approx 100m. The deck is still on top of the steel structure, so goes into compression when deflected. Transoms go from side to side across a bridge and carry the deck loads to strong steel frames on either side. This is usually on 'open top' through truss bridges or 'closed-top' through truss bridges. Annotation: Again the transoms bend down under load and the concrete contributes to compression strength. 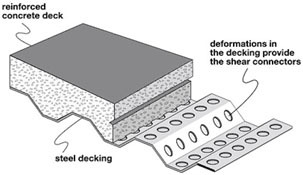 In a normal steel building the concrete can act together with steel decking, the steel decking taking the place of the regular steel reinforcing bars within the concrete. However in a bridge, the underside of the decking is liable to corrode over time, so is not counted as part of the reinforcement. It is just used as 'lost formwork'.